Two years after the earthquake and tsunami that killed thousands and triggered a nuclear meltdown, it is intriguing to observe how the “triple disasters” might have reinvigorated civic participation and activism in an otherwise politically apathetic society. What does this mean for the future of Japanese democracy? Two years after Japan’s “triple disasters” (earthquake, tsunami, Fukushima nuclear crisis), for many of the people directly affected it seems like the recovery stage has barely commenced. There remains a great sense of uncertainty about the future, with more than 316,000 people still living as evacuees. The way the disasters have been handled — especially the accident at the Fukushima Dai-ichi nuclear plant — has highlighted many flaws and shortcomings in Japanese democracy. Without denying these problems, there is also a need to look for more positive signs, and to try to identify trends that could have beneficial consequences. Natural disasters are ruptures in societies, both literally and figuratively, and they open up opportunities for change. Marking the two-year anniversary of the Tōhoku earthquake and tsunami, this article seeks to identify some encouraging developments for Japanese democracy. The accident at the Fukushima Dai-ichi power plant was the second-worst of its kind in history. This gave rise to three separate, independent commissions that examined the disaster and sought to identify the major contributing factors. In Western democracies, it is normal for there to be independent investigations following a major accident. But this tradition has not been present in Japan. Indeed, the independent investigative commission established by the Diet (parliament) was the first of its kind in the Diet’s history. As such, even the creation of these commissions has been an important step towards greater accountability and transparency in Japanese democracy. And by exposing grave, systemic problems in the way nuclear power has been managed and regulated in Japan, findings from these reports have made it much more difficult for the “nuclear village” to return to business as usual. There is now much more scrutiny into their behaviour, and much more emphasis on nuclear safety. This has translated into the new agency charged with overseeing nuclear power in Japan — the Nuclear Regulation Authority (NRA) — displaying much more independence than its predecessor, and setting significantly higher safety standards. It is still too early to determine how permanent these changes will be, but the greater levels of transparency that have been demanded as a result of the Fukushima disaster have potentially helped set an important precedent for Japanese democracy. A vital part of a healthy democracy is a vibrant civil society, and in the last two years there has been considerable growth in this part of Japan’s democracy. One impressive feature has been the large numbers of people who have contributed to helping after the disaster, with more than four million people having volunteered in one form or another. Such activities can have beneficial consequences in terms of building social capital, the “glue” that helps to bind and strengthen democracy. Most volunteers have participated through working for NPOs (non-profit organizations), which have played a prominent role in clean-up activities. Domestic NPOs have become a more familiar and accepted part of Japan’s political landscape following the Kobe earthquake and especially after March 2011, where they have been trying to assist in the rebuilding of Tōhoku in innovative and important ways. One example is Rise Together, an NPO focusing on women’s issues following the “triple disasters”. In addition to the important role such organizations have played in making sure women’s voices are heard in the recovery and rebuilding phases in Tōhoku, they also contribute more generally towards improving gender awareness in Japan, which is ranked 101st in the world for gender equality. Concern and anger over the Fukushima Dai-ichi disaster has led to a considerable rise in civic activism. 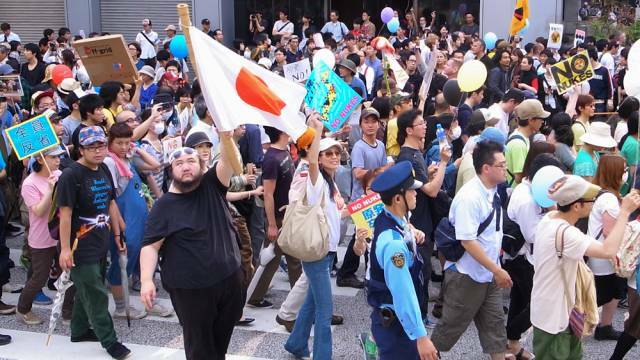 Most notable have been the weekly protests in front of the Japanese Diet. Protests peaked in the summer of 2012, with more than 170,000 people attending one rally. This is particularly significant in Japan, which does not have a strong tradition of protest — something previously stigmatised as “radical”. The Fukushima disaster has helped to normalize protest, with a wide cross-section of the community being involved: mothers, children, office workers and the elderly. The Fukushima issue has also encouraged a growth in political activism more generally. An instructive example is that the protests against nuclear power have inspired those opposed to Japan joining a free trade agreement to start their own weekly protest. The Fukushima disaster has also given rise to an ongoing debate about Japan’s future energy policy. When deciding on its energy policy, the previous government was engaged in much more consultation with the public than previously had been the case. There was a series of public meetings, and there has even been a polling exercise based on the tenets of deliberative democracy, which was the first time a government used this method during a policy process. The more people learned about nuclear power, the less likely they were to be in favour of Japan having it as part of their future energy policy. Japanese democracy has also been re-energized through its public becoming more aware about nuclear power, what alternatives exist, and what the pros and cons of each are. Even if it has yet to translate into policy change, there is now more information and discussion about these issues. With almost all of Japan’s nuclear reactors shut down, there has been considerable focus on the potential of renewable energies. Masayoshi Son, the influential head of Softbank, a telecommunications and Internet corporation, has invested heavily in this cause by establishing the Japan Renewable Energy Foundation and starting the construction of ten mega-solar plants, with the hope of renewable energies accounting for 50–60 percent of Japan’s energy production by 2030. Another significant plan is to build an offshore wind farm near Fukushima, consisting of 143 wind turbines that would generate 1 gigawatt of power, which would make it the biggest wind farm in the world. These are just some examples of important initiatives being taken in the renewable energies sector that could prove to have a great impact on Japan’s future. In addition, the Japanese public has also been learning to live in more sustainable ways as a result of the power shortages following the “triple disasters”, with energy-saving policies such as “cool biz” and “brown outs” proving effective. Dealing with climate change is a pressing issue for everyone, and if Fukushima can help move Japan — and other countries — towards more sustainable forms of energy use, then the disaster can still have positive effects for democracy. One should be careful not to over-exaggerate these positive trends, as there are certainly many others that point in the opposite direction: the December 2012 election had the lowest voter turnout in post-war Japan, and failed to convey the public’s general anti-nuclear sentiments, with the pro-nuclear LDP returning to power. Even if the accident at Fukushima Dai-ichi was designated a “man-made disaster“, there are few signs that anybody will be held properly accountable for what happened. Meanwhile, distrust towards politicians and bureaucrats has greatly deepened, which has potentially serious long-term ramifications for Japan’s democracy. Nonetheless, as has been argued here, the “triple disasters” have triggered an increase in volunteerism and civic activism, fostered greater debate and engagement in public policy, and helped to encourage more sustainable forms of living. All of these serve as important foundations not only for rebuilding the Tōhoku region, but to strengthen Japan’s democracy. This article was first published on 11 March 2013 in Open Democracy.